Parents and teachers, throw those boring old flashcards out! 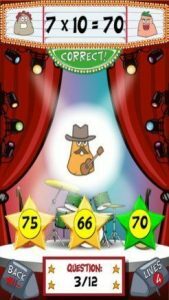 Now there is a rockin’ new way to practice math facts that your children will love! Math Rock Times Tables and Bingo takes math to a whole new level! By combining math with a fun bingo game, your kids will quickly become addicted to this app and keep playing and learning all day long! 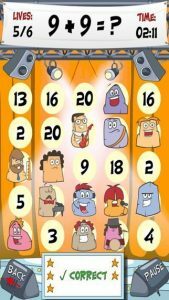 Math Rock has two modes of play to choose from: Times Tables and Bingo. Times Tables is a great way for your kids to practice their times tables. There are several options in this game so you can customize it based on your child’s level. You can select a specific number to practice and within each number you can choose to have the problems come up in numerical order (i.e. 1×1, 1×2, 1×3, etc.) or in a mixed order. There is also a Challenge option which is more like a timed test. The Bingo mode is my favorite. You can choose to play with addition, subtraction, multiplication or division. 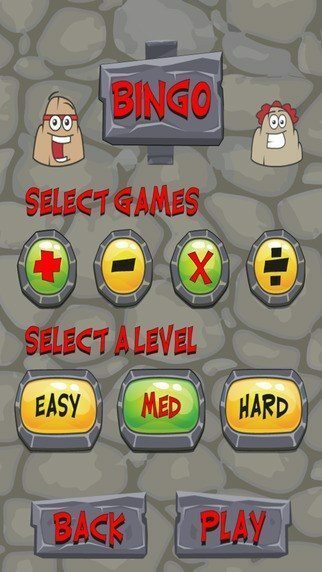 You can also select Easy, Medium, or Hard levels. 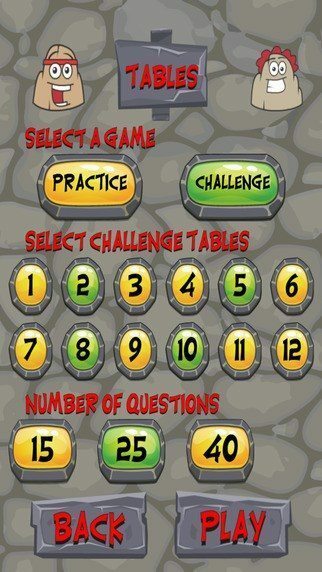 Game is played by looking at the math problem at the top of the screen. The player must select the correct answer from the bingo grid below it. Then another problem appears and the player selects the correct answer. The strategy here is to select the answers in an order that would get them a bingo either horizontally, vertically or diagonally. Play continues until the player successfully gets a bingo. Once you win, you can play again and try to beat your time or choose another math function or level to practice. This app is truly fantastic! I instantly knew it was a winner and as a parent of a second grader who is currently learning and passing off his timed math facts, I was excited to have him try it! Sure enough, he loved it! He said it was “way funner” than practicing with flashcards! Not only is the concept of this game engaging and unique, but the cute and funny characters that add to the enjoyment of this app. The characters are animated rocks that are dressed up like rock stars. 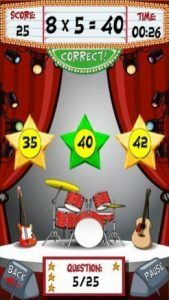 These cute rocks pop up all over the screen playing drums, electric guitar and more! I am so excited to have discovered this app and I will be keeping this one around for a while! I can’t wait to tell my son’s teacher about it as well and I am certain she will want to use it on the classroom iPads as well!